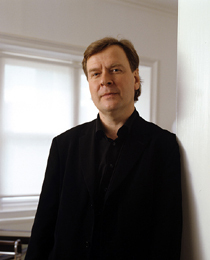 Magnus Lindberg studied at the Sibelius Academy in Helsinki with Einojuhani Rautavaaraand Paavo Heininen. His first piece performed by a professional orchestra was Sculpture II” (1982) but the first work to garner substantial acclaim was Action-Situation-Signification(1982), in which he started to explore musique concrète. This piece was written for and premiered by the new-music ensemble Toimii (Finnish for "It Works"). Around this time he also co-founded the ‘Ears Open’ Society with colleagues including Esa-Pekka Salonen and Kaija Saariaho; a society dedicated to the exploration of the European avant-garde. In 1983-85 he wrote a monumental piece for Toimii: Kraft,which has been performed around the globe. It includes chords with more than 70 notes and a meter-high score. It uses traditional instrumentation as well as percussion on scrap metal and spoken word. In the 1990s, Lindberg became increasingly concerned with harmonic structure, and a broad range of styles including minimalism, free jazz and rock became evident in his work. At the same time, he has been increasingly drawn towards large-scale forms, describing the orchestra as his ‘favourite instrument’.